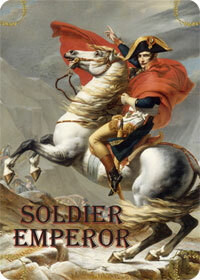 Between 1803 and 1815, Napoleon Bonaparte lent his name to an entire age. Soldier Emperor covers the entire sweep of the Napoleonic Wars from 1803 to 1815, as fleets and armies clash from Ireland to Persia. 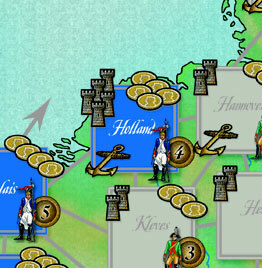 Military, economic and political factors come together in a game playable to completion in just a few hours. Each player has armies and fleets. There are also a handful of generals and admirals to assist these in battle and in movement. The best are Napoleon, Nelson and Wellington, standing head and shoulders above every other general. The worst is Austria's unhappy General Mack, along with the hapless Prince of Orange, Spain's arrogant Cuesta and Napoleon's profligate brother Jerome. Players have allies; some are set at the beginning of the game, other alliances are forged during the course of play. Everyone else is an enemy. No one is “neutral”; those are just enemies you haven’t attacked yet. Throwing a twist into all of this is card play. The universe is loaded with random elements; life does not unfold as an orderly series of “phases.” After a short countdown to start the game, players can play cards at any time, in any order. The cards (over there on the right) are the centerpiece of the game, giving it its free-wheeling nature. Dysentery can strike. Generals can vacillate. Local militia can appear to help. Soldiers might run off to loot. Bridges get burned, snow falls early, the harvests are bad, the harvests are good. Royal marriages, minor country alliances, the rise of new leaders — all sorts of events take place during card play. 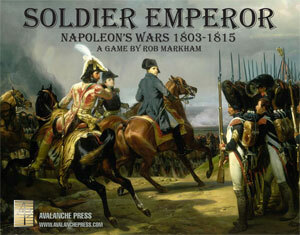 Soldier Emperor includes eight scenarios plus a campaign game covering the entire era. Play ends on a pre-determined turn or when a player has achieved his or her conditions for automatic victory, whichever comes first.